Are you ready to live in the future? Many of us would like to use flying cars, robots, and hoverboards. As we move into the future, we might also see flying taxis! 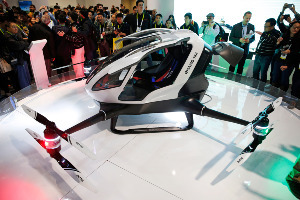 A Chinese firm, Ehang, is in the process of creating a taxi transportation service so you can fly to your destination using a single passenger drone. Dubai investors, such as Sheik Mohammed Bin Rashid Al Maktoum, support the project. Other companies like Uber and Airbrush, are looking to create a similar service. Now, taking all this into consideration, I’m sure you're wondering when this drone taxi service will be available. Investors like Sheik Al Martoum want 25 percent of the transportation to exist by 2030. This will start in Dubai with sky testing being done there until perfected. Then it will slowly branch out to the rest of the world. Meanwhile, Uber wants them out roaming the skies by 2020. Imagine how nice it would be to fly over crowded streets watching everyone below stuck in traffic, while you fly overhead. That's the main objective for this product. The flying drones will get people to places more quickly and easily, and will lower the chances for major accidents. Yes, it's true. We live in a time where flying taxis are slowly becoming a reality-something people could only dream of doing 50 years ago. And we can only imagine how many more options for transportation our future holds.